I have been using a lot of ground turkey lately for different things. The price has been right for it at the supermarket or at BJ’s where I can buy large packages of it and try different things. I have used it before in chili, turkey burgers, meatballs and even on nachos but I realized that I hadn’t given a turkey meatloaf a try. I am something of a meatloaf nut and love different meatloaf recipes so I was happy to take a look and see what I c ould find for turkey meatloaf, but to be honest I wasn’t bowled over by any one recipe that I saw anywhere. I then decided I would just do it on my own and see how it would come as far as flavor. To me ground turkey is one of those meats that needs seasoning and moisture, so I ended up putting a few things together and came up with this particular recipe of my own. Preheat the oven to 400 degrees. In a medium saucepan set over medium heat, add the vegetable oil and heat the oil until it is shimmering. Add the shallot and garlic and cook, stirring often, until the shallot has softened and is fragrant, about 2 minutes. Take the pan off the heat and allow the mixture to cool. In a large bowl, add the bread crumbs and the milk and allow it to sit for about 5 minutes. Add the cooled vegetables, the egg, the ground turkey, the Worcestershire sauce, the 1/4 cup of ketchup, 1/2 teaspoon of salt and 1/4 teaspoon of pepper. Mix the ingredients together by hand until they are just blended. Form the mixture into a loaf and place the loaf in a baking pan or on a baking sheet. Mix the remaining ketchup and tomato paste together in a small bowl and spread over the top of the meatloaf to coat it well. Bake the meatloaf in the oven for 45 minutes to 1 hour, or until a thermometer inserted into the meatloaf registers 170 degrees. Remove the meatloaf from the pan to a platter and allow it to rest for 5 to 10 minutes before slicing and serving. As is the case with any meatloaf, you can always add different ingredients that you like to give it some extra flavor. If you are going for something leaner, you could certainly add different vegetables, like grated carrots and onions. If you want a different flavor, try topping it with bacon or putting crumbled up cooked bacon into the meatloaf. You could also add a cup of mushrooms you have processed in the food processor to give the meatloaf another layer of flavor. There are a lot of things you can do, but this one was pretty basic and came out with really good flavor. We even made a little gravy out of some chicken stock and had it with the turkey and mashed potatoes. 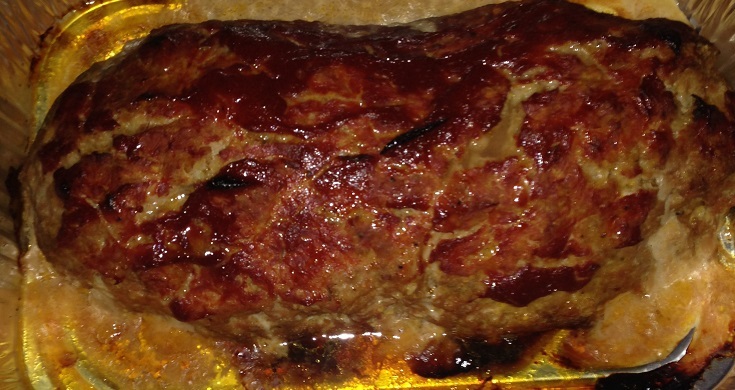 Of course, the turkey meatloaf is great for meatloaf sandwiches for lunch or dinner in the following days.